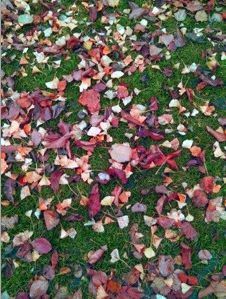 The other day I was struck by the flaming leaves, some vibrant red, some gently golden, forming magical carpets on grassy parks here in Cambridge. Is Autumn (in the UK- Fall in the US) so beautiful because we know it’s followed by a black and white landscape, where months may pass before we get a taste of Spring’s new green? Or is it just the decadent color that delights our eye, especially with the low angles of sun streaming in? Whatever it may be, I hope readers have a last leaf moment, a colorful indulgence, before winter is upon us. Sometimes a brief moment of beauty is enough to warm our hearts, bring a smile to our faces, and spread joy to others, all inspired by a single, red leaf.